AdBrite: As compared to AdSense, this platform has more relaxed terms for placing ads. It easily accepts small scale publishers such as bloggers, and its revenue is typically split with 75:25 ratio. Minimum payout is also lower than AdSense, which is only $5. But the only drawback is that it does not allow payments through PayPal. BidVertiser: According to certain bloggers, this one is the best alternative for AdSense. They claim to display highest bidders on a site, ensuring that you receive maximum revenue through your ads. BidVertiser pays you through PayPal with least amount of $10 and through Check with minimum amount of $50. Clicksor: Bid values for cost per click are quite high in Clicksor, allowing you to earn a decent income. It also allows you to add as many domains and sites as you want under your account. Clicksor allows both Check and PayPal, with minimum payout of $20 for PayPal and $50 for Check. AdToll: AdToll’s user panel has a great navigation and interface. It users the latest Ad technology, and campaigns both text and graphic ads. AdToll pays both through Check (minimum $40) and PayPal (minimum $20). InfoLinks: This one is the representative of next-gen in-text advertising. The advertisements can be tightly integrated within content, which means that no additional space is required. It claims to have the highest revenue share and most relevant advertising links in-text. Payments are made through PayPal with minimum payout of $100. Yahoo Publisher Network: This is much like the Google AdSense, with restricted terms and conditions like its counterpart. But the good thing about Yahoo Publisher Network is that you can integrate other Yahoo services in your ads too, such as Add to My Yahoo feature. Payments are made through Check and PayPal. Chitika: It is a leading advertising company for blogs with a network of thousands of websites and blogs with brand merchants and advertisers. It allows you to earn through their affiliate programs where you can earn as much as 10% of what are referrals are earning. 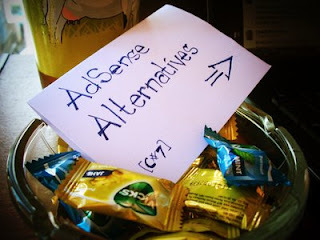 This is the best AdSense alternative if you are a blogger. Payments are made by PayPal and Check. eClickZ: This site provides customized units for advertisements to the publishers. It provides personal account managers to the publishers who can answer any of your queries, thus helping you in achieving maximum revenues. The site pays only through PayPal with minimum payout of $10. So, you can choose the best AdSense alternative and earn equal to what publishers on AdSense are getting. cpcGalaxy.com is a good alternative for adsense. I use this and reward aproximately $20/day with a 800uv/day website. I recommend this! I would add also cpmfun to the list, for entertainment sites they are really good.